London’s infamous Soho, straddling the shopping mecca of Oxford Street and the tourist hive of Leicester Square, is jammed packed full of lunch options. You’ll find burgers, burritos, sushi, and pizza on every street and a stack of special offers each day. On our last hop across Wardour Street though we spotted a new South African joint that is definitely worth a visit. The Joint: Bunnychow, 74 Wardour Street, Soho, London, W1F 0TE. You can find their fun site here. The Vibe: So what exactly is bunny chow? It’s gloriously simple. Grab a loaf of bread, rip it’s insides out, stuff it with a tasty filling. The dish itself originated from the Indian quarters of Durban, South Africa, and is thought to have been a creative and effective way for migrant workers to carry their lunches to work each day. It’s traditionally served with lamb or chicken curry and as a result they both dominate the menu at this fun Soho joint. Bunnychow’s small corner restaurant is branded brilliantly with rabbit based artwork and inside you’ll find a really relaxed vibe. Up behind the counter are hard crafted instructions and menus and you have a choice of white, brioche, wholemeal, and gluten free versions to choose from. We order a Durban on wholemeal and a Veggie with added fried egg. The wait for food is short and the initial impressions are huge. We’ll start with the Durban bunny. This is slow cooked mutton curry served with raita, mango chutney, pilau rice, and a poppadom sticking out the top. The curry has a huge flavour and is cooled down nicely by the yogurt based raita. It’s visually stunning and, quite frankly, a bargain at £5. From there the veggie bunny looks, and tastes, great with an added fried egg on top. Here you’ve got the same wholemeal loaf but this time stuffed full of cauliflower, chickpeas, and potato all covered in a spicy Durban sauce. Bunnychow is a well branded and tasty inclusion to London’s lunch scene and one we’re looking forward to visiting again. The Price: £5 for the Durban bunny and £4 for a full English. 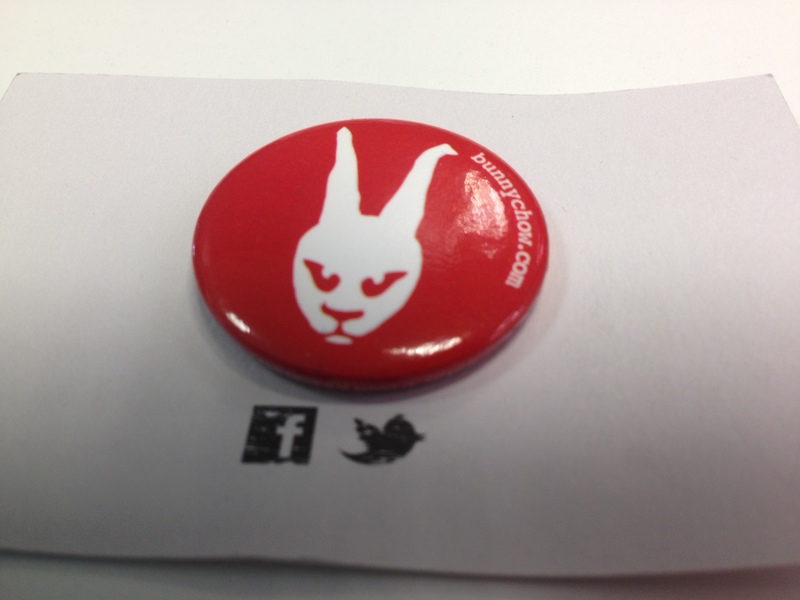 You’ll get 20% off your next bunny though if you take a free bunny badge. Posted in UncategorizedTagged all day breakfast, bread, brioche, bunnychow, cauliflower, chickpeas, curry, durban, egg, fried egg, indian, leicester square, London, lunch, oxford street, sausage, soho, south africa, veggie, wardour street, wholemealBookmark the permalink.